Amelia Island conjures up images of long, sandy beaches stretching out into beautiful blue waters and memories of the perfect getaway. At least that is what we hope you remember about our beautiful little island. Allow us to take care of the details so that all you need to worry about it is booking your tee time, soaking in the sun, or enjoying the best seafood the island has to offer. With over 40 years of experience, we strive to make your stay as easy and carefree as possible on your Amelia Island or Amelia Island Plantation vacation. Our Amelia Rentals team is always available to ensure you find the perfect Amelia Island house rentals or Amelia Island condos accommodations. From the first hello, to the last day on the island, your Amelia Island Rentals experience is guaranteed to be courteous, exceptional and extraordinary. Enjoy your Amelia Island Plantation rentals piece of paradise! Are you tired of paying too much to your Amelia Island rental property management firm for sub-par rentals and service? Are you getting nickel-and-dimed to death with high maintenance fees? If so, Amelia Rentals and Management Services, Inc. (Amelia Rentals), is your solution and peace of mind. Amelia Rentals will work with you on whatever your rental goals may be in Northern Florida. We have created a top-notch property management firm that focuses on quality Amelia Island rentals. Regarding guests, we deliver an unparalleled Amelia Island or Amelia Island Plantation vacation experience by supplying high-end linens and towels, having a superior cleaning staff and providing a simple process for vacationers to book their stays. This is a process that we’ve used for years and it’s proven successful in our bookings and repeat business. Our customer service and attention to detail at Amelia Rentals is unparalleled. 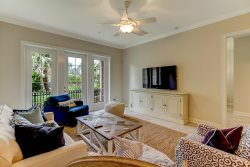 As an owner, you can rest assured that we will treat your Amelia Island vacation rental property like it’s our own. Maintenance issues will not only be addressed, they’ll be done in a timely and cost-effective manner. We are vacation property owners, so we understand! Again, we will give you service beyond compare. To that end, we have top-notch, trustworthy cleaning and maintenance staff and companies that handle all of our condos and houses. Crumbs on the seats, sand on the floor and doors left unlocked are not acceptable! If there’s a problem, we are there to fix it. If it’s a big problem, we have third party relationships with HVAC companies, plumbers, electricians and appliance firms. • Peace of Mind... It’s your investment, you should enjoy it too! • Multiple Advertising, Marketing, and Promotional Outlets. • Web Optimization and Personalized Property Page. • Detailed Maintenance, Repairs Report included in Monthly Statements. • Property Care: Fastest Response Time – Hands On – Real Time Solutions. If you are interested in learning more about Amelia Rental & Management, please call us at 800-874-8679, or email us at [email protected] (owner) or [email protected] (Owner relations). We will follow up with you immediately and provide every home owner with unmatched personal attention. Amelia Rental and Management Services appreciate the chance to earn your Amelia Island rental business.